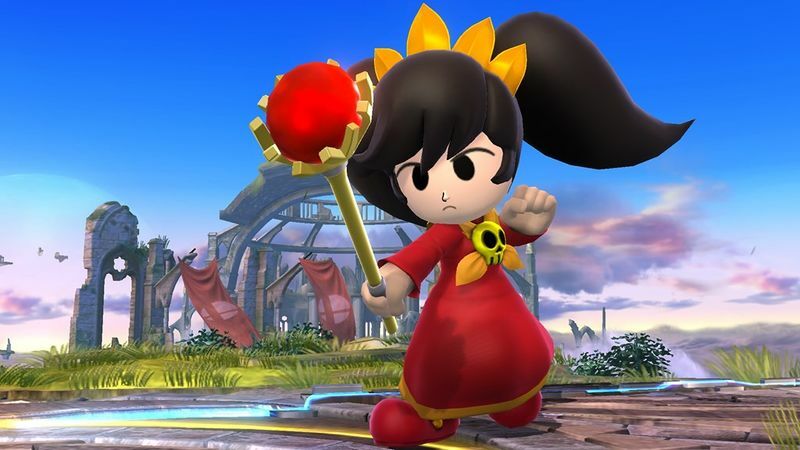 If we were to get a fourth Mii Fighter, I really think we need a Spellcaster. That. If he's not going to be playable, and he won't, then at least give me this so I can get my Mii Swordsman properly kitted. I'd actually love a lot of third party Mii outfits and trophies. The third-party Mii costume I want the most is Dig Dug. We would have both Pac-Man AND Dig Dug in the game. We did get Gil from Tower of Druaga. To complete the Classic Sonic characters. Bring Amy in as a Mii Swordfighter costume. Replacing the sword with the Piko Piko hammer. While they might have to make it an odd shape. Reminder that there are already costumes that makes the sword a club, a staff, or even Ashley's wand which are just blunt objects but still are made to work like a sword. I don't see Gunvolt getting a spot in the roster, but a Gunvolt costume would be amazing. I need a Meowth costume for Mii Brawler. This....this is what I would want most of all. I really want Squid Sisters Mii costumes, as well as Off the Hook Mii costumes. Originally, I thought Callie should be a Mii Gunner, but I'm starting to think she should use a Roller, and be a Mii Swordfighter. I can definitely see Marie being a Gunner, and using a Charger for the gun. Since Pearl is a dancer, I can definitely see her being a Mii Brawler. Marina is a keytar player, and I can definitely see her being a Mii Gunner, using her keytar. - Instead of just costumes and hats they should also mix weapons an pants as an option. One of the characters I wanted to make was Mike Jones from Startropics. I like the brawler's biker outfit but I wanted him to be a swordsman because I felt it fitted his play style better. So if I could select biker outfit with a katana (Mike's best sword) it would have been perfect. - Another thing I want is the ability to change colors in hat options. Instead of having 3 mushroom hats of different colors why can we just have a selection of color pallet swaps instead? Also hats like the top hat I may want in other colors other than purple like brown for Professor Layton or black for Abe Lincoln. These little additions can give a player a lot of creativity. - For swordsman and gunner I really want a left hand option. Being a left handed fencer in RL it really annoying that I can't make my Mii into a left handed swordsman. - I also think they should redo the stats customization. Instead of selecting 3 equipment items they should have a point system. Each character is given an set amount of points which they can spend into specific stats (defense, speed, jump, damage, knockback, etc). They can also spend them in special abilites like auto healing, exploding shields. etc and the price would increase the better the item. Not really Mii costume idea but I thought I would add it none the less. Made this a couple days ago. I don't expect any indies to get in as actual fighters, but winks and nods to the indie scene with stuff like this, Assist Trophies, or even just regular Trophies seems at least a bit possible. I know this may never be possible but I think it would be cool if Nintendo went crazy and made special costume packs for the Miis like a Marvel pack with Captain America, Iron Man, and Spider Man. A DC comics pack with Superman, Batman, Wonder woman. Shonen Jump pack with Goku, Naruto, and Ichigo etc. This idea popped up to me when I thought about how Nintendo made 8-bit costumes of different characters not from Nintendo inside Super Mario Maker and I think it would make the "Ultimate" Mii costume custom experience. Really sick to death of Mii' s being the only ones getting alternate outfits and every other character not having any other outfits and instead just having more color pallets for Cripes sake! This is really good. I can totally see these Mii outfits working. Using stone scabbard for Shovel Knight, Lunar Launch for Quote, and feint jump for Shante. You should show this on the Mii Character thread too. What do you see him as? A Brawler, a Sword fighter with a bone, or a Gunner with a Gaster Blaster arm? I always imagine Sans as a Brawler but that because the biker outfit worked really well for him. In fact! Here are some character costumes (For the other Playable characters who aren't Mii's) I want to see in Ultimate! Wow, this thread hasn't been active since August. Makes sense. With DLC on the horizon, and already selected, Mii costume DLC is one of the best hopes fans have for their fighters in Ultimate. I'm a Splatoon fan, and I want Octoling to be a fighter in this game, but if I can't get that, then the next best thing would be Octoling Mii costumes. Right now, the only new Splatoon Mii costumes we're getting at launch are the Splatoon 2 Inkling boy and girl. The Octoling Mii costumes would also consist of boy and girl versions. I don't got much but I'd like to see Poppi QT as a Mii Gunner to finish off the trio of Xenoblade 2 Mii Costumes. I would say Poppi QT Pi seeming as her sword is also a gun but... yeah I don't think they'll be putting her outfit on a Mii any day. 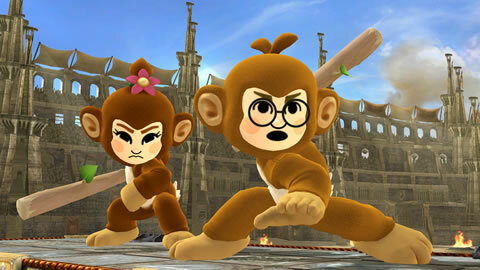 Monokuma as a Mii Brawler and Kamek as a Mii Gunner. I have some ideas for the Mii Swordfighter costume DLC that’s inspired by the Knight of Diamonds from the Wizardry franchise. -Series Background: The Wizardry series is a Dungeon-Crawler first released in 1981 and was developed by Andrew Greenberg and Robert Woodhead. It was very popular in Japan with many ports, merchandise, an OVA and exclusive games made . It also had a major influence on JRPGs namely Dragon Quest and Final Fantasy. The series made eight titles in the west until Sir-Tech the company who made the series went bankrupt in 2003. The rights to the ID were then given to Aeria IPM in 2006 which since been merged with Gamespot. The series since then been being made in Japan with the recent release being Wizrouge a rouge-like made for smartphones and PC has well a MMORPG. The Knight of Diamonds first appeared in the second game in the series. The plotline of the game is to find five parts the armor and get the Staff of Gnilda to save Llylgamyn. After you received the armor and the staff you must pick one of your party members to be the next Knight of Diamonds. The armor and the knight has appeared in other games in the series namely the Japanese titles. The Idea for this costume is inspired by the ending of the second game where you pick one of your party members to be the next knight. Pretty much making your Mii the new Knight of Diamonds. I choosed the Mii SwordFighter since Smash has too much sword characters might as well but it as Costume DLC and also have someone represent a game series with a major influence on many RPGs both West and East. That's all I could think of off the top of my head.